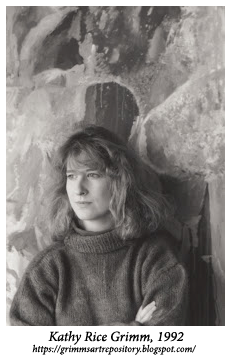 Photograph of Kathy Rice Grimm, 1992. Hello, my name is Kathy Grimm. I’m an artist and a teacher living and working in St. Louis, Mo. Grimm's Art Repository is my online journal dedicated to the fine art and literacy interests of my students, colleagues and family members. Most of the posts included here will list artifacts that I use in the development of lessons for elementary and high school age students. It is sometimes necessary for teachers to adapt the contents of a web journal for practical classroom use. Indeed, many students now go to class online. Some school districts have very restrictive policies concerning the number of websites that may be visited by children within their own private libraries and classrooms and it is for this reason, I have begun to write several online journals for my own classrooms: plaque de la mode, Thrifty Scissors, All Victorian Ephemera, Prickly Pins, Historic House Plans and A Guide to William Shakespeare are a few examples of my online journals for the classroom. In addition to these, I also have two larger coloring page websites called Color The Bible and The Crayon Palace. I maintain two year round, holiday blogs called, The Belsnickle Blogspot and Easter Egg Crafts. The Christian Clip Art Review is my desk-top publishing blog for clergy and there is also an older online journal called, Art Education Daily, that is the result of my k-12 certification in the state of Missouri.. I include methods of practice mixed together with themes among my entries. This is because art educators very often design lesson plans under the method or practice of art instead of the theme alone. However, this blog may be very helpful to those teachers developing lesson plans based upon social studies, literacy and healthcare as well. Artifacts here may be used to integrate subjects into a wide variety of agenda and should not be seen as limited to those practices or interests of art teachers alone. Virtual/Educational artifacts are listed according to topic on the index pages or by tags. Artifacts on this blog, may be used by teachers to construct or further extend lesson plans without the worry of violating copyright laws in the United States. Although most all of the extended lesson plans posted here are written by myself there are also articles from the public domain. I have meticulously researched and have represented these public domain materials here specifically for the purpose of free use under American copyright law for educators. Photography not created by myself are listed under the designer's name and may be propagated by teachers within the context of a classroom environment according to American copyright law. Need to read further about copyrights and plagiarism? Need to learn about the law and Derivative Works? Need to read further about International Copyright? Helpful questions and comments about the artworks are welcome.